The S.C Workplace Laws: Safety and Health on the Job is a job safety poster by the South Carolina Department Of Labor, Licensing and Regulation. This is a mandatory posting for all employers in South Carolina, and businesses who fail to comply may be subject to fines or sanctions. 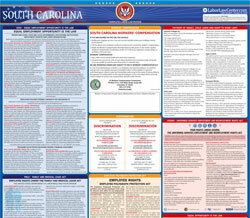 This poster describes South Carolina's detailed laws regulating employer and employee health and safety regulations. The poster lists the responsibilities of both employers and employees in maintaining a safe working environment, and describes penalties for failing to comply with safety regulations. It appears you don't have a PDF plugin for this browser. Please see the link below to download south-carolina-allinoneworkplacelawsposter.pdf. by the Director of Labor, Licensing and Regulation (LLR). of Labor, Licensing and Regulation. es or other benefits which would normally accrue to him. concerning matters of safety and health in the workplace. pursuant to the provisions contained in Chapter 27, Title 8.
to $7,000 dollars for a non-serious violation. more than $70,000 for each violation. of this plan directly to the Regional Office of OSHA, U.S. This poster is free of charge to all SC employers by contacting one of the agencies above. you’re covered by Workers’ Comp. This establishment may be covered by the S.C. Employment and Workforce Law. ment insurance through tax contributions. (7) calendar days before they become effective. unpaid wages, costs, and attorney’s fees in a civil action. dress and number listed below. person belongs - or does not belong - to a labor union. is not legally in this country and authorized to work. business abides by the law. cation of the employer’s business licenses. childbirth, or related medical conditions.